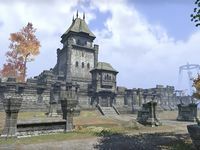 Castle Roebeck is a keep in central Cyrodiil, southwest of the Imperial City. It is initially controlled by the Aldmeri Dominion. It is connected via the Transitus Network to Castle Alessia, Castle Faregyl, and Nikel Outpost. Only the Dominion can use the fourth Transitus link to Castle Brindle. It is one of the six keeps an Alliance must control in order to crown an Emperor from their own. Castle Roebeck is seen in Oblivion as Fort Roebeck.